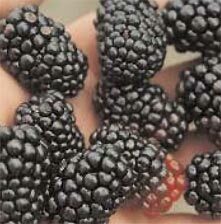 Thornless Blackberries are larger in size than the normal bush blackberry. The seeds are slightly larger and may not taste quite as sweet. The canes grow much longer than regular blackberry, therefore, they should have some support. The canes that grow during the summer will bear fruit the following summer and then are removed to the ground.